Comments: This is about Tim Ferriss’ formula for an ideal life. Quit your job/do as much as possible away from home, travel to places that are kind on your wallet, live the ‘ideal life’ and outsource most parts e.g. : saying sorry to your wife, to an Indian virtual assistant. This book has many many fans who will not agree with this rating. I know of somebody who is, in a way, living this book as well! He loves it THAT much! Make no mistake, this book is fantastic if you are entrepreneur. It has some great tips like thinking about outsourcing certain parts of your life that take up lots of energy. The issue I had with the book is that I just didn’t connect with Tim Ferriss’ value system. Ferriss proudly talks about winning the world kickboxing championship by exploiting a rule that is frowned upon for instance. It just didn’t work for me. Additionally, the primary premise the book is based on an assumption that a wanderer’s life is an ideal goal because it is ‘perceived’ to be so. I didn’t agree with that either. 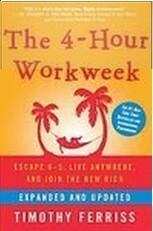 Neither did I agree with his whole premise that work is just means to an end – the end being sunbathing on the beach. I actually love the concept of a work as a way to make a difference in the world and connect with people. All in all, I didn’t enjoy the book. I still read it all the way through despite many urges to put it down to fully understand Ferriss (as much as I could gather from the book atleast) and try and see where he’s coming from. It just didn’t work for me.